I therefore have a few built and tested kits boxed and ready to go. July, 2014 MIDI bugs Some MIDI issues were present in the units sold by Kevin which I have developed hardware and firmware fixes for. In order to keep the products reputation high I have been updating and testing these previously sold units for the cost of parts & shipping (so a very low cost of a few dollars in the USA). Contact me if you want to send me the main card for rework. July 14, 2014 Sad to read today that Kevin Lightner passed away. RIP Kevin. March 25, 2014 As I'm also a software developer with experience in embedded systems I plan to enhance and support Opto-key moving forward. I'm really excited by this! As a tech I'm increasingly frustrated with the chore of trying to restore the (oxidized) key contacts on the MiniMoog to full operation, and unless it is frequently played the issue of "squirrelly keys" comes back. I have been installing Opto-key for my customers which removes the key cleaning cycle, AND adds note-on/off MIDI. Please see below for cost, shipping, and installation charge information. Once the on-hand materials such as circuit cards arrive I will commence building the product to Kevin's spec and make it available for sale. This Old Synth's "Synthfool Opto-Key"
If you landed here looking for the Opto-key upgrade for MiniMoog's then you came to the right place, welcome! The Opto-Key replaces the original mechanical contacts with infrared light sensors. No more contact cleaning or wear. Plays exactly like the original. Take a look at the Opto-key Install Guide to make sure you are comfortable installing it yourself; alternatively get a Tech to do it for you, or of course you can send it to me. Why Opto-key? As a tech I'm increasingly frustrated with the chore of trying to restore the (oxidized) key contacts on the MiniMoog to full operation, and unless it is frequently played the issue of "squirrelly keys" comes back. It is really hard to get them right, and a constant service cost for the MiniMoog owner. 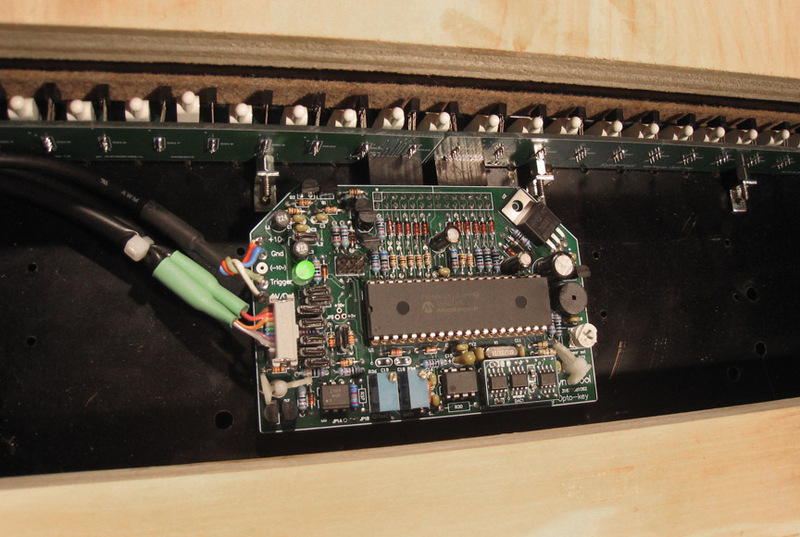 Opto-key resolves this by replacing an entire stock contact board (made of springs and buss bars) with a super high-quality optical sensor system. No soldering, no holes to drill*, no switches or wires to cut. Mini can be returned to stock if desired. Plugs directly into existing Mini keyboard connector. Ultra-high quality 16 bit precision digital to analog converter (DAC) capable of true 1v/oct readings of F=0.000v 1.000v, 2.000v 3.000v, etc. More precise than the original keyboard note to note, octave to octave. MIDI version sends and receives 44 notes of MIDI note on, note off data (includes parts for MIDI IDC to MIDI cable). Plays exactly like a stock MiniMoog- Mono, low-note priority (or with current firmware High or Low Priority can be selected), single trigger. Filters incoming MIDI to this same response too. Receives and transmits on separate MIDI channels. (9 & 10, or with current firmware Channel 1 - 15 can be selected). Full RFI filtering. Won't cause digital interference. 40 MHz processor provides 200uS keyboard scanning loop time. You cannot play faster than this thing scans! Reflective Vishay IR opto-sensors sense key presses. No change to Mini playability except smoother playing since there's no more springs to pull across buss-bars. More even key depth sensing than most vintage Minis. Eliminates the common "siren" problem associated with problem contacts. Only product that provides both MIDI IN *and* MIDI OUT from a Model D's keyboard. You can actually play directly into a sequencer or play any other MIDI synth. Status LED indicates key down and on-board beeper indicates power on self-test. Opto-Key MIDI $595. 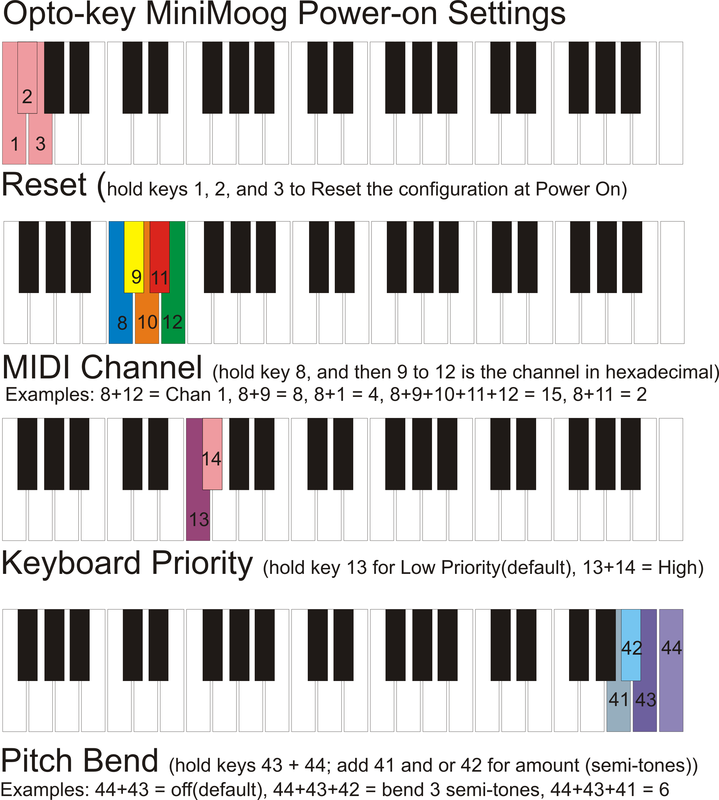 This adds MIDI-In and MIDI-Out to Opto-Key and supports Note-On and Note-Off. MIDI connection is via a cable which hangs out of the case rear that is terminated with quality 5-pin DIN MIDI connectors. Internally it plugs into the keyboard Cinch-Jones connector in place of the original key contact strip. No drilling, soldering, or case modification is required. 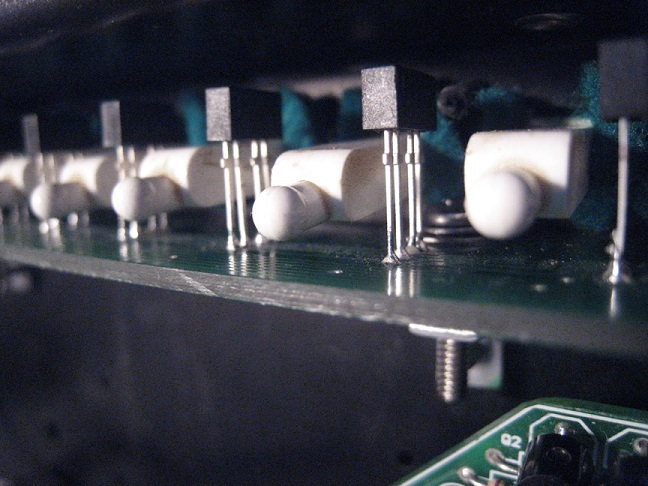 Your MiniMoog must be in overall good condition before considering installation of an Opto-Key. We recommend your keyboard first be cleaned, lubed and have new rubber bushings installed prior to installation of an Opto-Key. Installing both the bushings and an Opto-Key at the same time is highly recommended, as it's much easier to install both products together. The install process is detailed in the Opto-key Install Guide. The kit is designed for customer install, but if you are not comfortable with the procedure after reading the Install Guide then engage a Tech to do it for you. Alternatively you can ship your MiniMoog or its keyboard to me and I will perform the upgrade. Installation by me I will strip the key-deck, remove the old key contact assembly (returned to customer if wanted), remove old bushings if new ones are to be fitted (new bushings are an extra $42), clean the key-deck, align key posts, install and align Opto-key, hand-clean and refit keys, then test. There is a standard charge of 3 hours ($60/hr) for this so $180, or $222 with new bushings supplied. Note that the MiniMoog has to be tuned and scaled afterwards as the CV is now more accurate than before. You can send me your key-deck for this work to be carried out and then the shipping charge becomes the cost of shipping it back to you. Shipping Worldwide shipping via USPS Priority Mail Medium Flat Rate Box. Priority Mail is $24 for the USA, and they charge $74 for most non-US countries shipped to Canada looks to be $53. I purchase shipping insurance when available (included in above rates). Customs Declarations We will not lie on insurance, duty, import, VAT or customs forms. We are not responsible for any customs fees or taxes a buyer may be charged by their country. Do not buy if you cannot afford such possible charges as we cannot estimate them beforehand. Payment by PayPal only to a verified PayPal address. These are the Power-On configuration settings for Opto-Key. "After a couple days of sitting meditating I decided to do the job myself, and to my great surprise everything went well (= I did not manage to break it) and the system is working superbly!" "This Opto-Key is really a godsend!" "The Opto-Key seems like an excellent product so far. Haven't tried MIDI yet, but even without it this kit seems worth the price." "Hey Chris, the synth arrived in perfect shape. Plays great, what a difference in response with new bushings. Opto-key works great, I can tell the response time is quicker/more accurate. Lastly, just want to say it was a pleasure working with you. I am hoping to get many more enjoyable years out of the Model D now that is back and actually even better then new. A Little History Kevin Lightner developed a top rate solution for the weak point on the Moog MiniMoog, the key contact assembly. Adding MIDI capabilities to this solution enhanced it greatly. When Kevin's health deteriorated to the point where he could no longer assemble these units he contacted me and we transferred the project complete to This Old Synth. I have further enhanced it and give release history etc. below. Ver 1.1: The original hardware version from Kevin was 1.1 and I have had circuit boards made using the same artwork. If you would like to have your hardware updated it is possible to remove your mainboard and ship it to me for to incorporate the 1.1b hardware changes and to update the firmware to the latest level. The charge for this is a little to cover the component costs and shipping. Ver 1.1a: Due to MIDI-In reliability issues surrounding the fact that a 4N25 Opto-coupler had been utilized in the original design I made component value changes to rectify this, along with developing software fixes(below). This hardware change is indicated by a 1.1a sticker on the bottom right of the main board. Ver 1.1b: I'm currently shipping Opto-Key at H/W version 1.1b which replaces the MIDI-In opto-coupler with the more industry standard 6N138 (the same chip as deployed in the SMD version). SMD Version and Sensor Cards: I have been building sensor cards using the new circuit boards I had made. The solder mask is red to differentiate them. They are the same design as the originals and high quality. I paid to have the cards electrically tested by the manufacturer and can report that they work perfectly. I'm currently shipping the original design mainboard with its DAC sub-board, and had more of these made (in green!). In the picture you can see the surface mount version 1.2 of Opto-Key I designed for an all red solution. The surface mount (SMD) version 1.2 with a small mod to 1.2a is fully working, but I need a (very expensive) Pick and Place machine to build it with. I have been getting some Pick and Place machine time to build this version, and its follow on SMD version 1.3 (purple board) which has all of the hardware changes to date incorporated. F/W version 2.8: The final firmware version supplied by Kevin was ver 2.8 and is shown on the label attached to the CPU. Opto-Key firmware is updated via replacement of the plug-in pre-programmed CPU. If you would like to update your firmware to the latest level then contact me and we will make it happen. F/W version 2.9: This resolved software issues that affected MIDI stability as mentioned in the hardware section. F/W version 3.0: This introduced options for reset to default (MIDI-Out CH10, In CH9), or select MIDI Channel 1 to 15 with MIDI-In and MIDI-Out having the same channel number. F/W version 3.0b: The option for High (default) and Low keyboard Priority has been added and applies to both the physical keyboard and the MIDI interface. Key responsiveness has been further improved in this version, and the threshold pot now goes from minimum with no keys detected. This allows you to gradually increase the threshold setting to find the lowest setting where a note sounds so you can finely adjust sensor gaps. F/W version 3.0d A user with a Kronos controller was suffering hung notes. Investigating this showed it was transmitting MIDI Time Code ($F8). Turning off the transmission of MTC resolved the issue. This release filters message $F8 out in F/W. There is also an Alpha release of Pitch Bend on MIDI input but this has not worked correctly so has been withdrawn and is not supported. F/W version 3.0i: The current version shipping is ver 3.0i: Code tidied. MTC also sends Start/Stop/Continue messages ($FA/$FB/$FC) so these have also been filtered out.